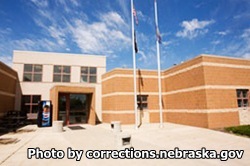 Nebraska Correctional Youth Facility is located in Omaha Nebraska. It is mixed custody facility that houses minimum, medium, and maximum custody juvenile offenders who are between adolescence and 21 years of age. Selected offenders may work within the institution in various supportive roles performing janitorial duties, maintenance, culinary work, and laundry. Additionally, some inmates are eligible for work release/educational release. Vocational programs offered at Nebraska Correctional Youth Facility include culinary arts, horticulture, and landscaping. Offenders can also receive counseling, life skills courses, victim impact counseling, mentorship programs, and various treatments designed to problem solve through critical thinking. Offenders can have up to two visiting sessions each week, two sessions may not occur on the same day, only one session per day. General Population inmates have visiting on Fridays from 5:30pm-8pm, and on Saturdays and Sundays from 12:30pm-3:30pm and 5:30pm-8pm. Special Management Unit has visitation on Mondays from 1pm-3pm. Safekeepers/Orientation inmates/Protective Custody inmates/90 Day Evaluation inmates have visiting on Mondays from 5:30pm-8pm, and on Fridays from 1:00pm-3:00pm.